Catching my breath as I reached the top, I was amazed and enchanted by what I found. 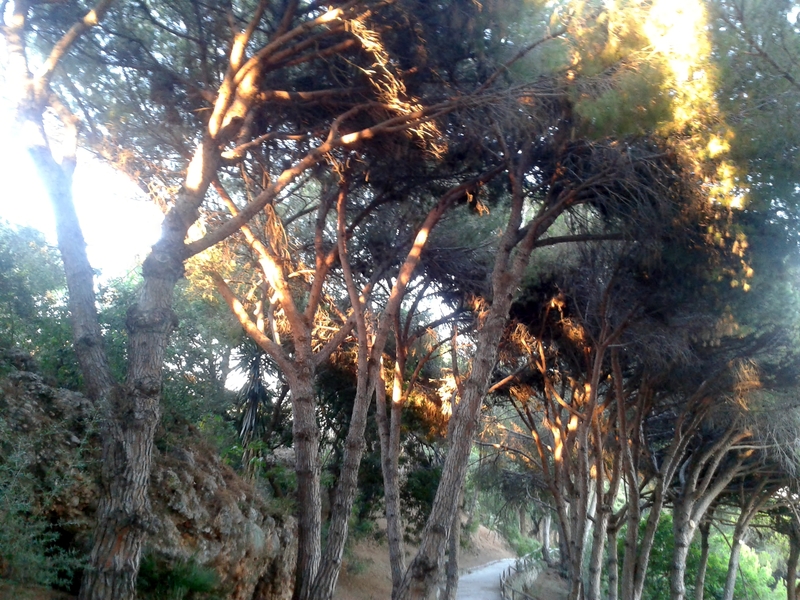 Instead of the padlocked gates I expected, as I turned left, I stepped into a pine tree canopied path, delighting in being so unexpectedly plunged into a natural environment so close to Marbella Town centre. 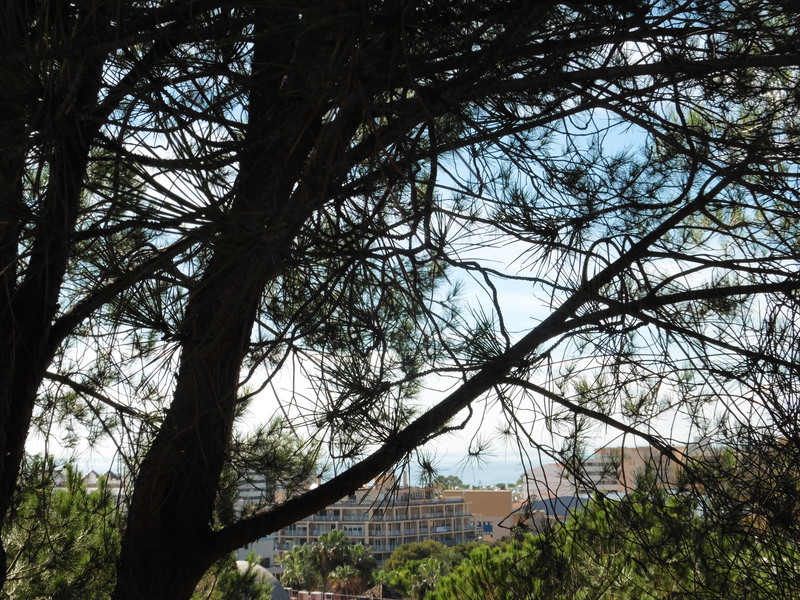 As I followed the pine-scented path, I caught glimpses through the foliage of Marbella Town’s tower block rooftops and the sea beyond as though from another world and time, while the sounds of chirruping birds swooping and flitting from tree to tree before me, provided a delightful contrast to the distant roar of the busy midday traffic below. 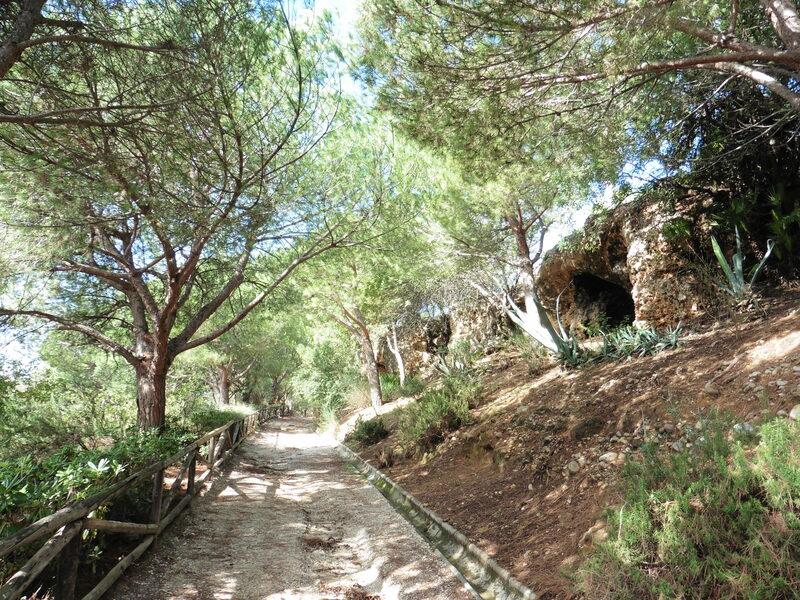 The hillside is pockmarked with shallow naturally formed caves. 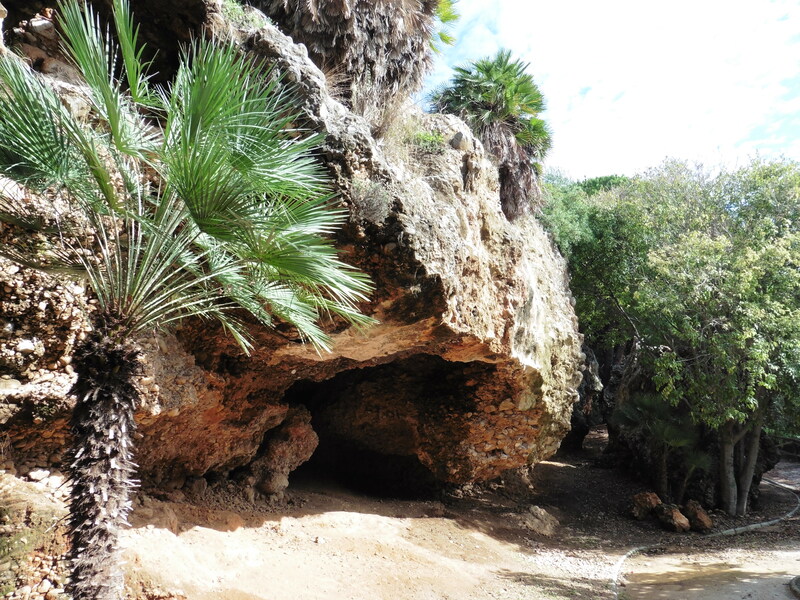 I have since discovered that the whole hillside, called El Pecho de las Cuevas (literally “The Breast of the Caves”), was once a completely forested area from the ground up to its summit and that these caves were used by the goatherds in times gone by, to take shelter with their flocks from the rain. 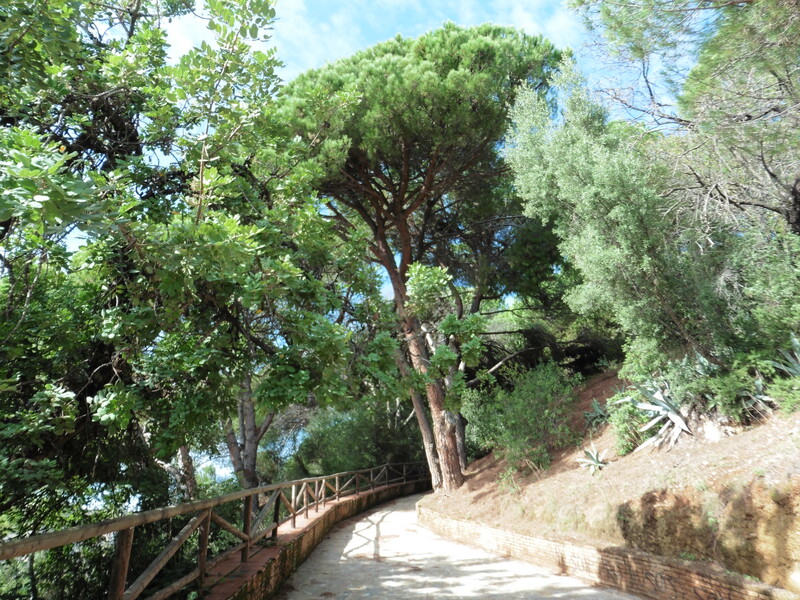 It is also possible to turn right at the top of the steps but this stretch of path has less of a pine forest feel, with tended garden areas; although it does have a couple of deeper caves than in the other direction, under which a friend and I took shelter in a recent downpour – like the grateful goats of yesteryear. Whichever way you decide to turn, the paths open up onto another discovery for me – the Paco Cantos municipal outdoor sports centre (Polideportivo Munipal), apparently built on the plains that were used by Marbella’s Shooting Club back in the early 50’s as a clay and live pigeon shooting range, known back then as Los Llanos de la Pólvora – literally “The Gunpowder Plains”. 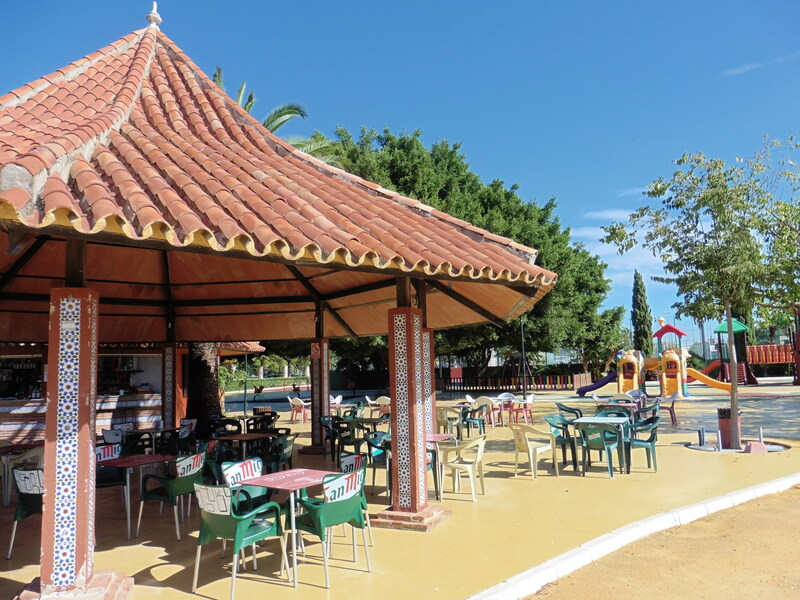 The sports centre has 2 five-a-side football pitches, 3 tennis courts, a basketball court, 3 padel tennis courts and a two-walled frontón court, as well as a large children’s playground that faces the central café-restaurant. With floodlit courts, it is open from 9 am – 11 pm Monday to Friday and until 9 pm at the weekend. 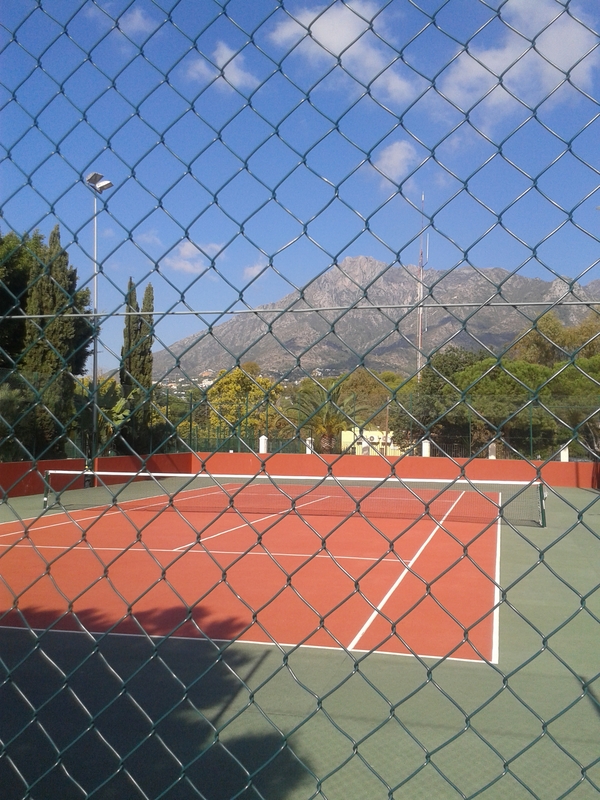 The prices are incredibly cheap – only €3.08 an hour for the tennis and padel tennis courts in daylight hours and €5.14 for a floodlit court after dark and you don´t have to be a resident to use the facilities. The receptionist informed me that they don’t take telephone reservations and to book any of the facilities, you have to turn up in person and pay on the spot but that you can book the courts up to a week in advance. During the week, the restaurant offers a Menu del Día at lunchtime (a set menu that includes two courses and a drink, coffee or dessert). The last time I was there with a friend a couple of weeks ago, we both had salad as a starter and for the main course I chose grilled fish and homemade chips while my friend opted for the meatballs in tomato sauce, which, with a drink and coffee came to just €8.50 a head. They do barbecues at the weekends which I have yet to try but even if you just feel like a mid-morning coffee or a sunset drink, it’s a lovely place to sit and observe Marbella’s healthy wholesome local family life going on around you: Adults watching over their young children in the playground while enjoying a drink and a chat with friends, basketball teams and people of all ages playing tennis and padel tennis. 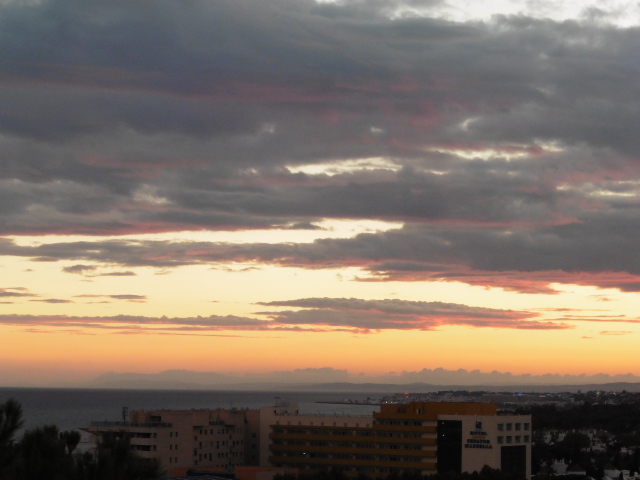 Even if you just come up for the views, these are spectacular at any time of day both out to sea to the south and Marbella’s La Concha mountain as a fabulous backdrop to the north. 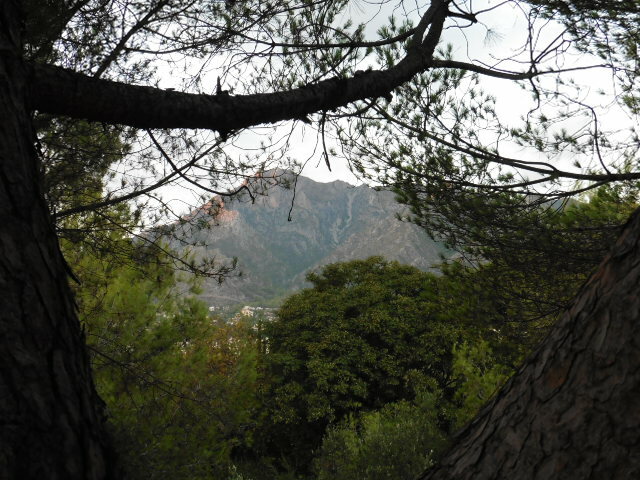 Having returned on various occasions since my initial discovery, as part of my “alternative tour” around Marbella Town for visiting friends, I would say that there is something particularly magical about going up there on a summer evening to watch the sun sink into the sea beyond the buildings of Marbella Town, enjoying the cool mountain-tinged air from this privileged perch – a seeming world away from the holidaying crowds below. 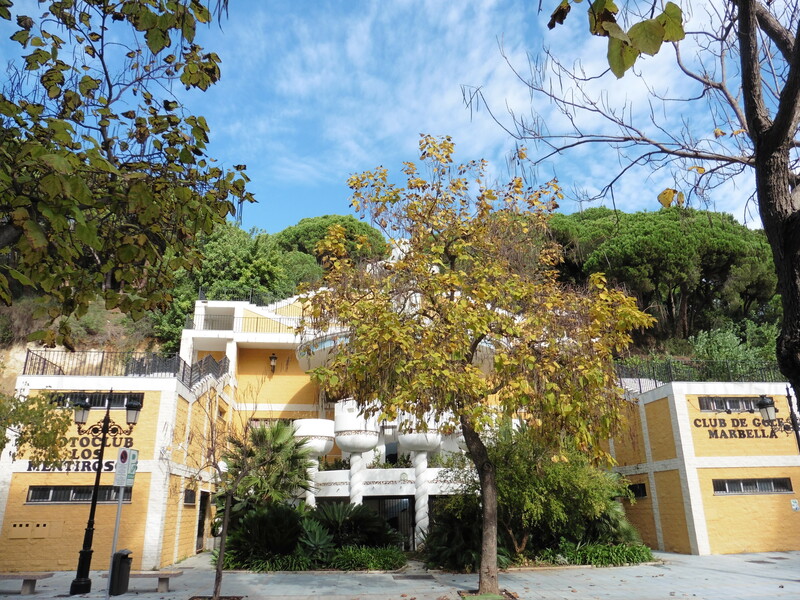 Although the Avenida de Canovas entrance to the sports centre has a car park, so you can drive there (see map in the photo gallery), I would recommend that if you are fit enough to climb the steps, you access from Jacinto Benavente in the daytime, so as to enjoy the forested paths of Marbella Town’s “gunpowder plains” in all their magnificent natural splendour. Hi Liz you have done it again!!!! Fantastic. Sign me up for this tour. Sounds intriguing. Will be delighted. Bring your walking shoes!! Thank you for all the helpful, juicy, inside scoop and wonderful photos. 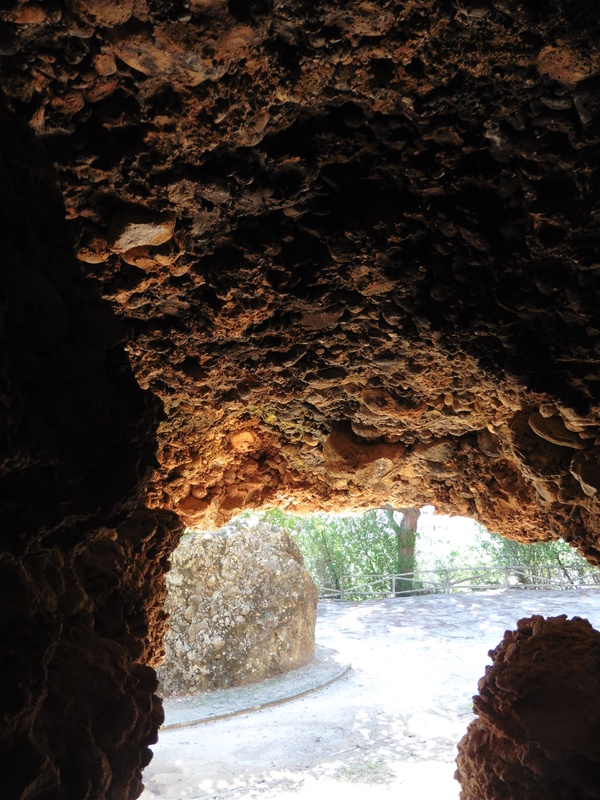 Fantabulous blog – thank you for sharing. Will most definitely check back often. Liz, I really enjoy reading your blog, I feel as if I’m there with you. Thank you Nicky – it is my intention to take my readers along with me on a journey of discovery and so your comments are incredibly encouraging.